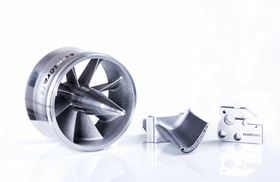 Components produced using additive manufacturing with high-performance metals. Premium AEROTEC, a specialist in metal laser melting for aerospace, has signed a cooperation agreement with molded parts specialist toolcraft. The companies plan to advance the development of components made using the metal laser melting process, including both the manufacture and quality assurance of the powder as well as the production and post processing of parts. A further goal is to obtain the certification of additive processes for the aerospace industry. Toolcraft has been manufacturing precision parts for Premium AEROTEC for many years, and now the company also delivers laser-melted parts. As part of the cooperation, toolcraft's additive production area will have its own building. The company has invested in an additional laser melting system and increased the machine park to a total of five machines. The M2 multilaser features an innovative laser system and two 400 W lasers are now used instead of one. ‘We are pleased to partner with AEROTEC, a company interested in advancing development in the area of metal laser melting,’ said Christoph Hauck, MD of toolcraft. This story uses material from toolcraft, with editorial changes made by Materials Today. The views expressed in this article do not necessarily represent those of Elsevier. Sandvik Coromant has signed an agreement to become a premium partner of machine tool manufacturer, DMG MORI.